Like many foundations, ours began with just a few families with a mission to advocate. This is the story of how we came to be. 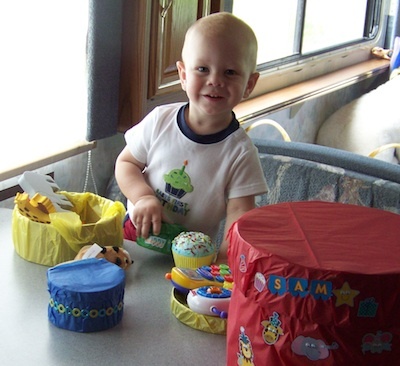 Our son, Samuel, was sick for months before we knew his symptoms had a name. Food Protein Induced Enterocolitis Syndrome is what the allergist confirmed after months of trying to pinpoint it on our own, with just the pediatrician’s help. We had been brushed off by several specialists, and continued to be brushed off even after receiving the diagnosis. FPIES, for short, is a delayed severe food allergy of the gut. Reactions are delayed and can occur hours after eating, and in Samuel, and several others who experience chronic FPIES, reactions can be delayed for days after introducing a new food, making it especially difficult to pinpoint the cause. Imagine my surprise when just before our son’s confirmed diagnosis, I joined a large online support group for FPIES and his same, bizarre, delayed symptoms were echoed in these “rooms”—as if these mothers were standing there in my living room, and not spread across the country in virtual rooms. From unknowns in isolation, we achieved understanding in empathy of other affected families. Just as important as the support given and received were the tools shared. These tools were pieces of several resources that moms were finding on their own, and coming together to share. The information shared here was very valuable—to each new parent, even to the veteran parents, learning new things daily about this little known allergy. At the time that I joined the now large, support forum, I was member #69. It quickly doubled in size as the months passed. It seemed that although FPIES was rare, the amount of families joining was increasing quickly with no known reasons why. With no diagnostic tools for doctors to diagnosis FPIES and with limited research, what happens to the families who don’t find this support forum? Those who aren’t online or who don’t have FPIES knowledgeable medical providers? It took months for me to find a doctor knowledgeable in FPIES who could recognize my son’s chronic condition. There had been months of him being sick; all the throwing up, diarrhea, sleeplessness, screaming in pain, and losing weight. What if it took even longer? What would families do to keep their children thriving when certain foods that they are feeding them, that are meant to nourish, are acting as toxins in their body? We started our journey with FPIES after the birth of our first daughter, Bridget, and still continue on this road, now with our younger daughter Caitlin, who also shares this diagnosis. When Bridget was an infant, we were very alone, living overseas and lacking medical support for a diagnosis we were attempting to newly navigate. Over the years, we learned to seek out the support she needed, and learned how to cope with the day-to-day challenges that accompany this condition. When Caitlin was born, we were able to put everything we had learned to good use. Both of the girls react to multiple foods and eat very restricted diets—FPIES is a very present part of our daily lives. 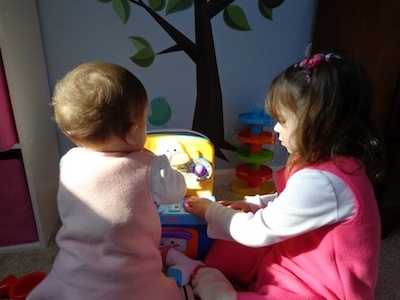 One day shortly before my daughter’s first birthday, I decided to start posting on the forum, and honestly, I wish I would have joined these groups much sooner. I no longer felt so alone. There were parents, other families, who saw the same things happen to their children that I saw happen to mine. They were strong, positive, and empowered by reaching out to help other families, such as mine. What I discovered was an incredible group of parents, working hard to help their children have brighter days. Many of these parents were doing this with little to no medical or social support. All of the parents were happy to share information about how they approached food trials, where to find medical journal articles about FPIES, how to use baking substitutions, and so forth. The parents there often commented how nice it would be to have all of this information centralized, so that new parents joining the community could easily access the tools that existed—both the credible medical information and the day-to-day parent and family resources. By late spring of 2010, I started having these discussions about creating a place for this information with a now very close friend, Joy Meyer, one of the founding families of the FPIES Foundation and current executive director. The seeds for the Foundation were planted! At the beginning of our children’s diagnoses, we both began a blog—a journaling of our struggles and successes, a sharing of recipes and tools. Having learned how empowering shared experiences were, we wanted to give back. Families connected with us, and soon we both were meeting other families through our blogs, our large support forum and other locations. These families, who were strong advocates for their children as well, wanted to reach out. They had interest in connecting the dots for future families, as well as providing resources and supportive services for today’s families. These were families who wanted to establish a non-profit foundation for FPIES. This foundation would be a home for all these tools and resources, shared from families and the medical community, collaborating for the health of each child. The founding board was comprised of eight original families, spread as wide across this country as we have children spread across the spectrum of this allergic syndrome. We knew it was vital to the foundation to have the insights from a collaboration of voices. These voices of professionalism, coupled with their diverse talents, would create the cornerstones of the Foundation for FPIES. Alongside our founding board, we invited esteemed medical advisors comprised of experts in the field of food allergy and FPIES diagnosis and management. We have always been very committed to providing a medically credible and reliable resource for this rare, oftentimes isolating diagnosis. Parents can be their children’s best advocates. We feel it is part of our responsibility as a Foundation to help support parents in this role. After our founding, we knew reaching out and helping families to discover their voices was essential. For the next step in our Foundation’s development, we introduced family-friendly tools and resources addressing every step of living with an FPIES diagnosis. These include but are not limited to a medical practitioner locator, an expansive and thorough question/answer section, and printable resources for awareness, daily living, and emergency situations. Living with a rare disorder can be extremely isolating, so we also provide tools for families to build support groups and to create new support systems. We have not forgotten the medical professionals who support our community. With an esteemed medical advisory board, we have developed tools for practitioners to better educate themselves about FPIES, and to learn ways to connect with the families they serve. With the growing multidisciplinary additions to our medical advisory board, and a panel of volunteer parent advisors, we continue to put a name and a voice to FPIES, empowering families to be strong advocates for their children. We also empower the medical professionals who care for our children living with FPIES to share resources and tools to make the everyday lives of FPIES children and their families easier. Today, we continue forging the road to empowerment for families and the medical professionals that support them. By following this path, FPIES awareness, education and research all remain at the forefront of our Foundation’s mission. We are diligently working to deliver new educational initiatives for the coming year, directed at various facets and disciplines within the healthcare community. Once complete, these initiatives deliver tangible tools into the hands of those professionals who can in turn pass them directly to families in need of support and day-to-day resources. Furthering FPIES education will continue to raise greater awareness of this rare disorder. This awareness, coupled with improved FPIES education for medical professionals, will set the stage for increased interest in FPIES research. More importantly, under these initiatives, special projects, and the resulting increased awareness, children affected by FPIES will gain opportunities for improved quality of life and better daily FPIES management. Our children deserve to have brighter and pain-free days. At the FPIES Foundation, we will continue to move towards achieving these goals as we maintain focus on the heart of what brought the Foundation together in the beginning: the families and the children we care for and empower every day. The FPIES Foundation is an Incorporated 501(c)3 non-profit foundation whose mission is dedicated to overcoming the challenges of Food Protein- Induced Enterocolitis Syndrome by offering tools for education, support, and advocacy to empower families and the medical community. We provide a network of caring—the support you need to support your child at the FPIES Foundation website, and a blog from the FPIES Foundation. Amanda LeFew is the mother of two girls diagnosed with FPIES. To read more about the family’s journey, please visithttp://fpiesfoundation.org/inspiration-stories-the-lefew-family/. Amanda is a founding member and a current Co-Director for the FPIES Foundation. Joy Meyer is the mother of four, their youngest child, Sam is living with FPIES. To read more about the family’s journey, please visithttp://fpiesfoundation.org/inspiration-stories-our-little-man/. Joy is a founding member, and current Executive Director for the FPIES Foundation.